hangs above the planet's rings in this image from the Cassini spacecraft. Water jets that spew from the moon's south pole region are also visible. I don't think I'll ever tire of seeing pictures of Saturn's moon Enceladus, with those captivating water jets and plumes at its South Pole. And this new images from the Cassini mission is just stunning... and intriguing. "Be moved by crescent Enceladus with its ghostly geysers floating above Saturn's glowing rings." There are over 100 geyser jets of varying sizes near Enceladus's south pole spraying water vapor, icy particles, and organic compounds out into space. Enticingly, this distant and small moon (313 miles or 504 kilometers across) has a global subsurface ocean of liquid water, as tidal forces from Enceladus' orbital relationship to Saturn and another moon, Dione heats the interior. 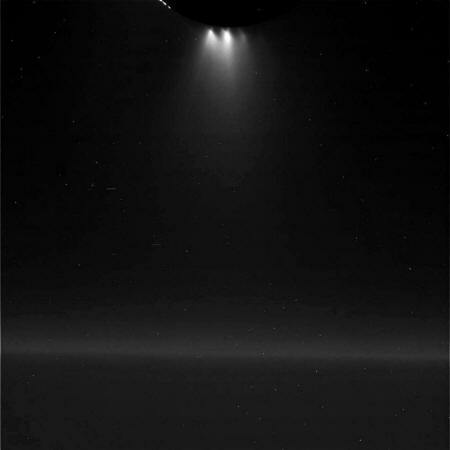 Liquid water and the observation of organic chemicals in the plumes of Enceladus make this moon of high astrobiological interest to scientists. No other world has such well-studied indications of habitable conditions." While the rings of Saturn are also beautiful, they are they are frozen and geologically dead. "The small ring particles are too tiny to retain internal heat and have no way to get warm," the Cassini imaging team explained on the CICLOPS website. This image was taken in July of 2015, and was not part of two close flybys of Enceladus in October of this year. "Cassini's stunning images are providing us a quick look at Enceladus from this ultra-close flyby, but some of the most exciting science is yet to come." 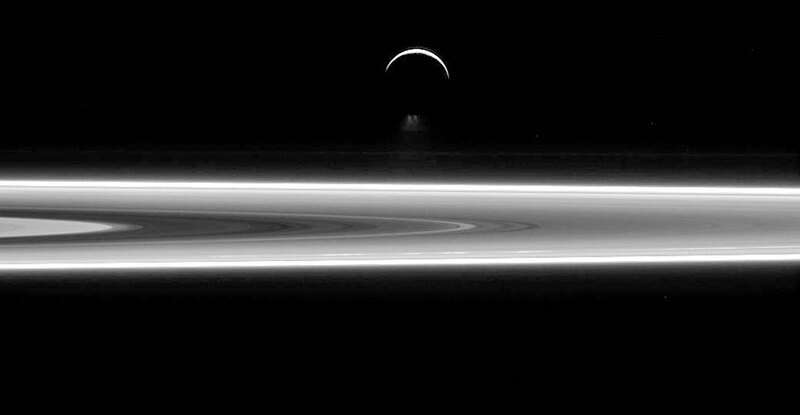 This beautiful view of Enceladus and Saturn's rings looks toward the unilluminated side of the rings from about 0.3 degrees below the ring plane. The image was taken in visible light with the Cassini spacecraft narrow-angle camera on July 29, 2015. The view was acquired at a distance of approximately 630,000 miles (1.0 million kilometers) from Enceladus and at a Sun-Enceladus-spacecraft, or phase angle of 155 degrees. Image scale is 4 miles (6 kilometers) per pixel.